To honor the hard work and dedication of students and staff at Job Corps Centers around the Commonwealth, including those at Red Rock in Lopez, Sullivan County, Pickett authored House Resolution 470 to designate Oct. 16, 2013, as “Job Corps Day” in Pennsylvania. 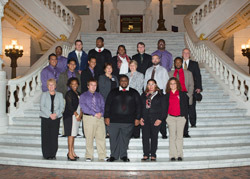 Members from Job Corps centers around the state traveled to Harrisburg that day to be recognized by members of the General Assembly. HARRISBURG – Students and staff from Pennsylvania’s four Job Corps centers were recognized by the House of Representatives on Wednesday, as House Resolution 470 designating Oct. 16, 2013, as “Job Corps Day” in the Commonwealth was unanimously adopted by the chamber, said Rep. Tina Pickett (R-Bradford/Sullivan/Susquehanna). “Job Corps offers students the opportunity to earn a high school diploma for those youth who do not have one. And not only does this give them the education and training they need to enter the job market and be successful, but it also gives them the encouragement they’ll need to survive the challenges of the world today,” said Pickett, who sponsored the resolution and was impressed by the work of her local Job Corps center in Lopez, Sullivan County. Nearly 50 years ago, the United States Department of Labor established Job Corps to achieve the goal of providing hands-on training to low-income students in America’s fastest growing careers. Job Corps is the nation’s largest technical training and education program for low-income students between 16 and 24 years of age. An estimated 60,000 students per year benefit from the Job Corps program, by taking courses in more than 100 industries and career paths, including automotive and machine repair, construction, finance and business services, health care, hospitality, information technology, manufacturing and renewable resources. Currently, four Job Corps center operate in the state: Keystone Job Corps in Drums, Philadelphia, Pittsburgh and Red Rock in Lopez. Pickett not only publicly thanked the students for their participation in the program but also expressed her appreciation to the staff and faculty at these centers for giving the bright young men and women the opportunity to succeed.